The sequel to the smash hit inFAMOUS released last month, and it has been receiving exceptional reviews from both critics and users alike. The sequel from Sucker Punch also got a great collector’s edition for fans of the series to pick up. 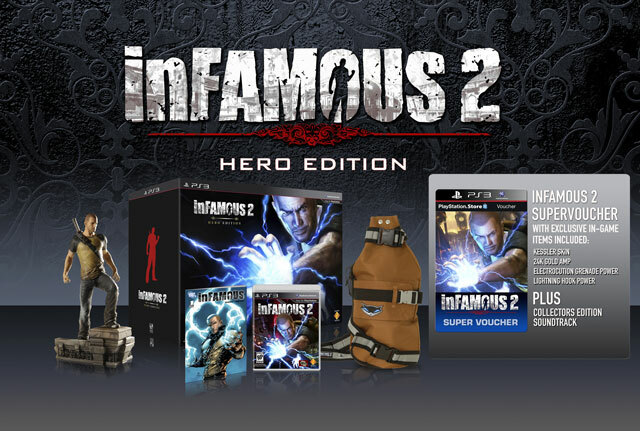 What’s even better is that those that have yet to try out inFAMOUS 2, they can get inFAMOUS 2: Hero Edition for a great deal from GameStop. Considering I was one of the ones that purchased the Hero Edition on release day, this is a fantastic deal considering all that you are getting included with the game. Everything in the collector’s edition is top notch quality, and well worth it. The current regular edition is being sold for $49.99 at Gamestop, so you are paying $10 more for a ton of extras. Will you be picking this up at your local Gamestop or online?